Jonathan Engineered Solutions is an ISO 9001 & AS 9100 certified manufacturer of slides and electronic rack accessories. 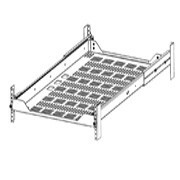 Jonathan is now offering a complete line of light duty and medium duty off the shelf (COTS) rack shelves and trays. The T2U-100 rack shelf is a 2U high standard light duty electronic rack shelf that comes as a complete assembly as shown and easy to install in most EIA racks. The shelf assembly includes 370 series slides which lock open, are quick disconnectable, and have adjustable brackets attached. 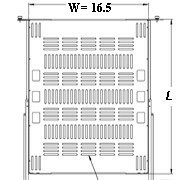 The rack shelf assembly has front mounted panel fasteners to lock the tray closed, and has a load rating of 165lbs per shelf. Optional upgrades such as cable management, anti-slip pads or server straps are available upon request.